If you ever find yourself simply walking through Carol Park and you have enough time on your hands to discover a less common tourist attraction, with a medieval appearance and gorgeously built out of red bricks, then be prepared to be surprised. Right in the center of the park there is the Water Tower that was built by the architects Stefan Burcus and V. Stephanescu in 1906, to commemorate 40 years from the coronation of Carol I, a moment when the Romanian authorities decided to organize the famous Romanian General Exhibition. The Tepes Castle had a functional and utilitarian purpose. It was supposed to host a water reservoir, but it never fulfilled its purpose and it remained in history as the building that copied the architecture of the original Tepes Palace from Poenari, Arges County. Those who are interested in visiting this tourist attraction, it can be found on Candiano Popescu Street no. 6, Bucharest. The Catle’s tower, measuring about 20 meters high and 8 meters in diameter, used to host a huge cylindrical iron basin with a capacity of 200 cubic meters and a 6 meters diameter. This was able to fill the inside of the tower entirely, leaving room only for a narrow spiraled staircase, which used to climb almost to the top of the building. The basin was constructed in the workshops of Oscar Maller and was assembled in the Palace’s interior. From the Castle’s tower, from a special platform, one could admire Carol Park and Bucharest’s panorama. A powerful counterfort, completed by a wooden porch, holds the tower from crashing down, and in the right side there is a castellated stone wall, finished in the corner with another tower of smaller sizes. Sadly, short after Queen Elizabeth opened the Exhibition, accompanied by the notes of 100 thumpers and the gun shots of the Calafat Company, the water basin became unused and it remained this way until this day. 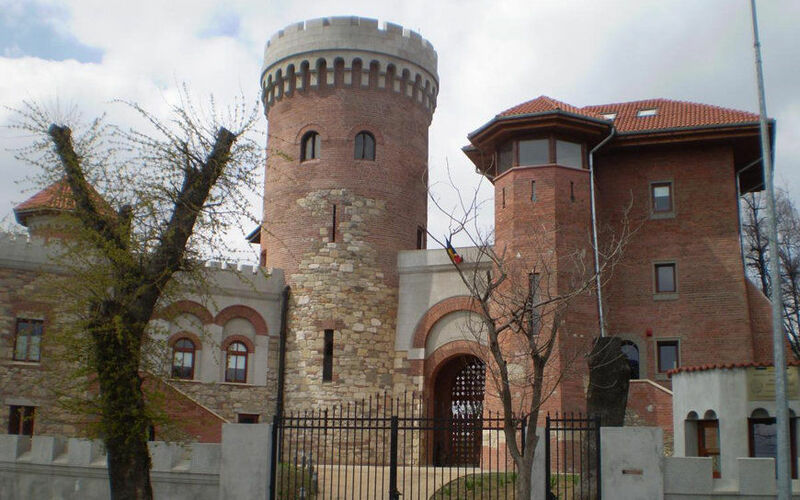 After the relocation of the Unknown Soldier at Marasesti and the inauguration on 30 December 1963, the mausoleum nearby (built on the site of the former National Military Museum), Tepes Castle continued to be used by soldiers who provided security for Carol Park. In 2010, the Castle was included in the list of national historical monuments which meant respecting a set of specific rules, applicable to those buildings which were part of the National Patrimony. Unfortunately, the access at the inside of the castle is permitted only twice a year, due to security reasons. The building hasn’t been repaired or restored since 1990. The only days when the Castle can be visited are National Heroes Day and Army Day (25th of October). Still, every visit is one that you will surely remember. Besides the unique architectural style, you will also enjoy a gorgeous view of Carol Park and you will also get to visit the Mausoleum and the Tomb of the Unknown Soldier.